Meredith G Kline (1922-2007) was a scholar of the ancient Near East, and one of the most influential and original Reformed theologians (covenant theology) of the last half century. 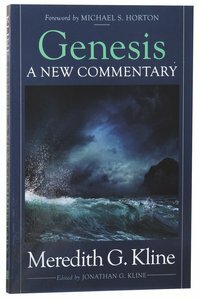 This posthumously published commentary sets out his brilliant interpretation of Genesis - a must-read for serious students of Scripture! About "Genesis: A New Commentary"
Dr. Meredith G. Kline (Ph.D. degree in Assyriology and Egyptology, Dropsie College), an ordained minister in the Orthodox Presbyterian Church, for over half a century,served as a professor of Old Testament at Westminster Theological Seminary (in Philadelphia), Gordon-Conwell Theological Seminary, and Westminster Seminary California. He is the author of highly original books God, Heaven, and Har Magedon, Glory In Our Midst: A Biblical-Theological Reading of Zechariah's Night Visions, Images of the Spirit, The Structure of Biblical Authority and Kingdom Prologue: Genesis Foundations for a Covenantal Worldview-Editorial Review.